It's cold! It's cool! It's time to create a snowman drawing filled with great accessories! Whether it's cold or not outside, it's always fun to illustrate this amusing cartoon character. 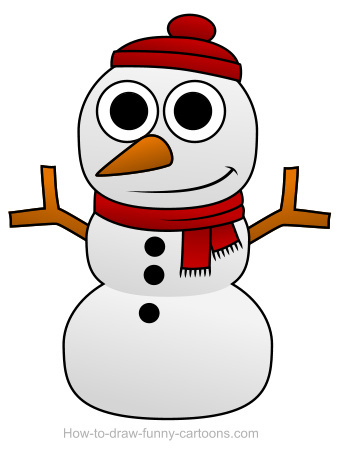 If you don't have the opportunity to create a real snowman using snow, then you can always draw one using real pencils! Grab everything you need (including a vector application) and let's start drawing! First, you need to sketch the character using simple basic shapes. I usually like to use three circles to create the head, the body and the bottom part of the character. It's also a good idea to use two large circles to illustrate the eyes. You can also draw a few accessories like a scarf and a hat. Don't hesitate to use a simple design if you are not comfortable with these elements. Good! Now we need to add more details. You can add two large circles to represent the pupils, a triangle to form the nose and a thin line to illustrate the mouth. You can complete the scarf and the hat using lines and circles. Next, draw three circles on the stomach and draw some arms using rectangles. Great! Let's add some color now! 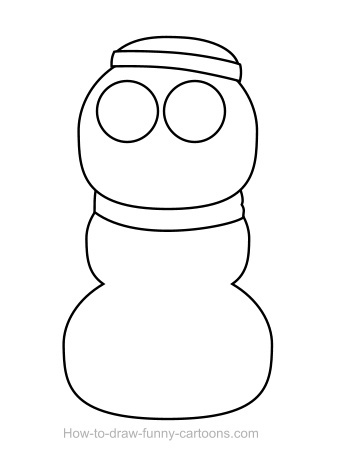 For now, you can use plain colors to fill in the snowman drawing. If you prefer, you can also skip this step and move on to the next one. You can color the hat and scarf in red and the arms in orange. The nose can also be colored in orange. The body of the cartoon character must be colored with a light grey color. Why? Because using white will make it difficult later on to add a simple effect on the illustration and give more depth to this one. Select the gradient tool and add a second color to each shape available in the drawing. For example, you can add a darker tone of red on the hat and scarf. It's an easy technique to add more depth to the objects. Repeat the same step with the arms, the head, the body and the nose. 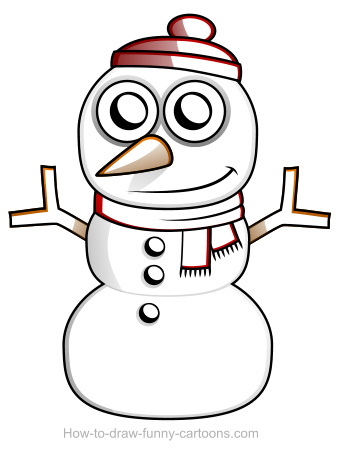 The snowman drawing already look more interesting, but we can make it even better. You can give more volume to your image by adding additional shadows made from new (darker) shapes. On the hat, you can use a dark red color on your shadow. On the body, you can choose a dark grey color while the arms can be filled with a dark brown/orange tone. Shapes added in the previous steps are great, but slightly too dark to create the desired effect. Your vector application must have a tool that allows you to create transparency on a solid shape. Use this tool and partially hide all shapes to end up with a more subtle result. As seen above, light shadows are perfect to give more depth to the illustration. Remember when I said earlier that the body and head must be colored in grey to create a great effect? Well it's now time to illustrate how lighting is working on the body of our little cartoon friend. 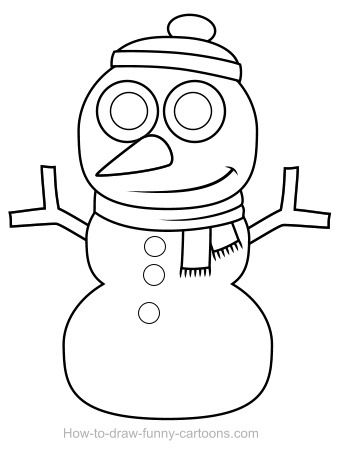 Draw white shapes on all elements of the snowman drawing. Then, make sure that all new shapes are slightly smaller than the original ones. Once again, these shapes are clearly too bright to create the best effect possible. You will need to use transparency again to partially hide these white shapes. Since the light source is probably located on the right of the cartoon character, you must keep these white shapes brighter on the right side of the illustration. One last modification that can be done to complete the drawing is change the color of the outlines. For each shape, simply select a darker version of the color already available in this one. For example, the outline of the arm can be done with a dark orange color. Good job! Our snowman drawing is now finished. I hope you had fun creating this cute character. Don't hesitate to draw more versions using your own style and your own technique! It's all about practicing!